(From left): David Crystal, Ford Williams, John Sharp Kirk, Martha Rose Wright, Sydney Hayes, Kathleen Giddens, and Beaty Hill. The Memory Project is a unique initiative in which art students create portraits for children and teens around the world who have been neglected, orphaned, or disadvantaged. Assuming that children in such situations tend to have few personal keepsakes, one purpose of the portraits is to provide them with special mementos that capture a piece of their childhood. 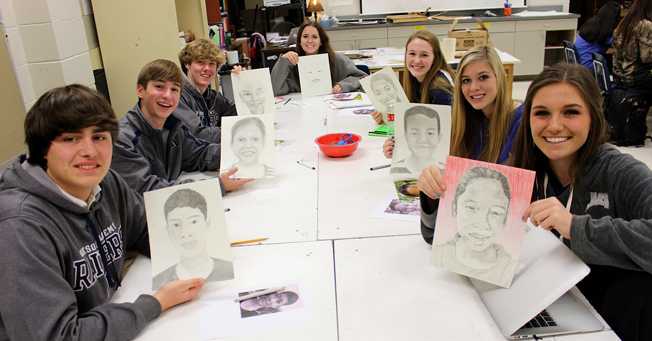 To do this, art students receive photos of children on the Memory Project’s waiting list and then work in any medium to create the portraits (drawing, painting, digital art, collage, etc). Next, Memory Project team members deliver the portraits to the children as gifts, and take photos of the children holding the portraits so the art students can see the delivery in action. Within our nurturing and spiritual community, Jackson Academy inspires and equips each student to lead a life of purpose and significance.